One of the most controversial subjects in recent years has centered around stem cell research and its potential applications in the field of medicine. As this debate has evolved, too often good sense and discerning sanity have been sacrificed on the high altar of fear and emotion. 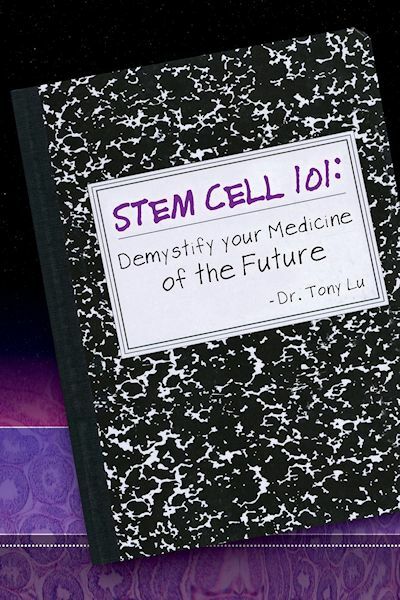 Dr. Tony Lu has written a balanced and objective book that provides its readers with accurate and insightful answers on the history, evolution and current state of this rapidly progressing field. This book fully deserves to be called Stem Cell 101, for it assists the reader to understand what a stem cell is, the difference between embryonic and adult stem cells, how these cells are extracted from the body, the difference between Hematopoietic stem cells and Mesenchymal stem cells, the potential for stem cells to prevent various kinds of disease, as well as how our nation has fallen behind the cutting edge of the research that is now happening throughout the world. Tony Lu has the microscopic eye of a bench scientist and the insight of a physician who has seen the world through many diverse cultures and cities. Born of Chinese descent, he immigrated to the United States and became a United States citizen along the way to a medical career that has spanned three decades. Most recently he served as the Chief Medical Officer at WA Regenerative Medicine, Ltd. in Shanghai, China; and at United Family Healthcare in Guangzhou, China. This is where his interest in stem cell medicine escalated, where he witnessed his Asian colleagues making significant findings that were encouraged there, but are not possible yet in the United States. Dr. Lu has comprehensive working knowledge of East meets West integrated medicine, including both functional and regenerative aspects of treatment. In addition to adult healthcare, he is also proficient in anti-aging, stem cell medicine and medical acupuncture. He is a doctor of the world. Tony Lu speaks English, Mandarin, Cantonese, French, and Vietnamese. He admits that beyond communicating primarily in English, "I pray in French, calculate in French, and hold my deepest emotions in Cantonese."